This show is a new Standup comedy show produced by comedian Eshetu Meleses. It talks about human right violations which were previously taking place in Ethiopia. and it shows that violence could never be the solution to our problems. and it states that despite all our differences, that we are all human and equal. It has the message of democracy love and unity. THS SOLE OWNER OF THIS CONTENT IS COMEDIAN ESHETU MELESE AND THIS IS MY FRreporter CHANNEL. ግሩም! በጣም አዝናኝና አስተማሪ የሆኑ እውነታዎችን የያዘ ነገር ነው።ቀጥልበት ብዙ መማር ይቻላል!!! ኤችአይቪ እና ዘረኝነት መድሃኒት ማይገኝላቸዉ ለምንድነው ? የዘረኝነት መድኃኒት አዲስ አበባ ናት !!! Eshe! Our proud! 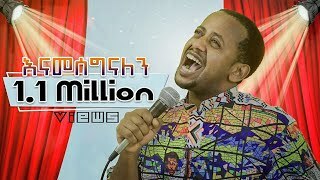 The new world of comedy for Ethiopian! When and where is his next show? Alzheimer bezer yemitlalf beshita new. Merfe bemewugat ayitelalefim. You want to deny the truth. Betam harif temirt setehal gn besmeab sitel yekeld nw yemimeslew bitichil ye bet kiristian kalochin atetekem. betam des yemel akerareb sakna kumneger .. bertalene!!!! Wwow comede mallete ante nhe lalawe tkadeno yebsele. TOP SECRET: Dr Abiy Ahmed & Zinash Tayachew - ዶ/ር ዓብይ ሚስቱን ለምን ዴንቨር ላካት? ?